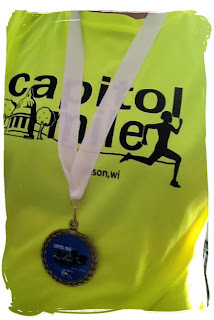 I’ve mentioned that I have been coaching three boys to run the Madison Mini Marathon half. I even went so far as to say they were totally nailing their training. So I am a few steps ahead of elated to tell you that they nailed it, and even placed in their age group. It’s true. I am checking weather forecasts, race time predictors and pace charts. I am thinking about my racing shoes and my race day wardrobe. I’ve ordered some gels and have restocked my Bodyglide supply. It’s almost race time, baby. And I can’t wait. This is a very newfound feeling, which hit me like a load of bricks today. And I couldn’t be happier. Mint’s boys with big smiles after successful races! I love Thanksgiving. Spending time with family and slowing down to count our blessings for a few days is good for the soul. Kick it off with a road race and you have all of the ingredients for a perfect holiday. Almost every year since 2005, I have run the Berbee Derby on Thanksgiving morning. The race features a 5k and a 10k. Both courses are hilly and you never know what mother nature will bring on race day: sometimes it is -20 degrees with biting wind, other times it is 50 degrees and sunny. Either way, it is always a treasured start to my Thanksgiving. I used to get up early Thanksgiving morning and come out to race. However, as my children have grown, we have made the Berbee Derby a family tradition. Rather than racing, my husband and I run with our boys. Well that was awesome. Marathon number 13 rocked. 3:27:09.